Christoph Eschenbach delivers some old school Beethoven here. The 'insights' of the historically informed performance movement don't have much relevance to the way he conducts this music. Eschenbach's biography in the liner names Karajan and Szell as his mentors, and their spirits certainly live on in this expansive and opulent Missa Solemnis. But then, every recording of this work is expansive and opulent, even the John Eliot Gardiner, although perhaps not quite to the same extent as here. Eschenbach's tempos are only a fraction slower than Gardiner's, but his flowing phrases and the round, warm tones he draws from the London Philharmonic make everything seem more laid back. Eschenbach has a long-standing relationship with the London Philharmonic, and the orchestra is able to deliver exactly what he asks of them. He likes big, round sounds from the strings and woodwinds, which is exactly what the players produce for him. That sonic beauty does occasionally threaten the music's drive and logic. 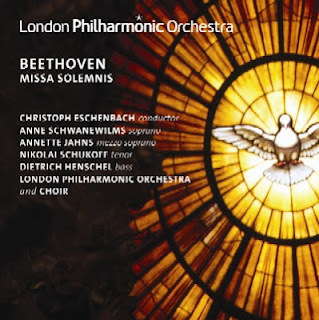 The orchestral interlude at the heart of the Sanctus, for example, contains some magnificent orchestral playing, especially from Pieter Schoeman in the violin solos. But the concentration on orchestral colour has the paradoxical effect of diminishing the sense of atmosphere. Beethoven is rarely concerned about the music's liturgical status, but in many of these quieter episodes, even its symphonic logic is compromised. Live recordings are increasingly becoming the rule rather than the exception, but it is still unusual to find a new release based on a single performance. Only orchestras with a track-record for near note perfect performances even consider the idea. Thankfully, the London Philharmonic is one such orchestra, and despite the many risks, they just about pull of this single performance release. There is some ragged ensemble that would no doubt have been dealt with if a second performance and a patch session were on the agenda. The very opening, for example, isn't quite spot-on, and nor are the horns at the start of the Agnus Dei. The choir, for the most part, are on top form, and cope admirably with the many challenges Beethoven sets them. But when voice groups are heard in isolation their tone can sound a little fragile. That happens with the sopranos in the Kyrie and later with the tenors in the Gloria. The soloists all put in fine performances, projecting admirably above the huge orchestral textures, and balancing well with each other in the ensembles. Eschenbach asks a lot of them in the louder sections, but always gives them space to shape their phrases in solos. There is a wonderful moment in the Sanctus, when soprano Anne Schwanewilms floats over the top of some complex but quiet textures. And Beethoven makes sure they all get similar chances to shine, although more often than not it is in louder music, where emphatically articulated consonants are required and sound production rather than musicianship is the key virtue. Everyone seems to have their own views on Christoph Eschenbach, and this Missa Solemnis is more likely to reinforce than to challenge them. He's known for emphasising tonal beauty over structural logic, and there are plenty of passages in this recording to demonstrate that. And his musical values are traditional, not to the point of imitating conductors of the past, but certainly out of line with modern conventions. I'm prepared to treat that as a virtue, although some more sprightly textures might have helped to move this performance on a bit. The disc is not among the finest available of this work, but it records a performance that was clearly exciting and often engaging. It's good, but I suspect the live experience was more fulfilling.